May I ask the source on this one? You're not the only one. 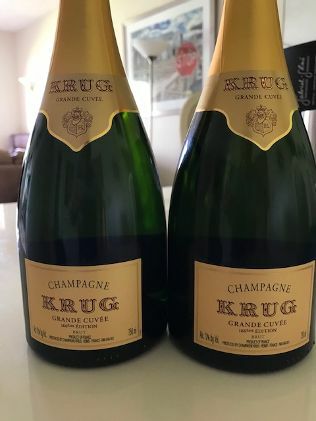 I've never been a Krug fan. I meant the 166 specifically. +1, and particularly do not care for 166. Were you the one that outbid me?!? I don’t care who she outbid. I’m just glad we’re buddies! I have one of these. I distinctly remember thinking that $60 was a lot to pay for it. Sorry John haven't been around today. They are all gone. Once & Future Teldeschi Vineyard Zin...takes me back to the old Ravenswood days. some 2017s—Bouchard and Latour-Giraud, white Burgs. Last edited by Mich@el Ch@ng on March 25th, 2019, 11:55 am, edited 1 time in total. 3 each of 2002 Taittinger Comtes BdB & 2012 Biondi Santi Tenuta Greppo Rosato. Went back for some 2015 Cote Roties that I missed earlier. 4x 2000 Les Carmes Haut Brion @ 85!per from Neal’s Montrose source. It should be in its prime drinking age now. Another case of 2016 AP Vin Bien Nacido Z block syrah. The first bottle was so good, I had to get more!! 3 x 2013 Liquid Farm Golden Slopes on sale at $34! 25% discount and free shipping? Easiest decision of the day.